We are pleased to announce the release of the second guidebook in MAS series of practical guides for media managers (see Guide #1: Product Management for Media Managers). The purpose of these guides is to help media decision-makers understand some of the key topics in digital news provision, and give them practical support in adopting concepts that will improve their operations and streamline how their companies work. The series aims to provide practical guidance and strategic direction to help media organizations navigate the digital transition, including best practices to implement different strategies, processes, tools and techniques. 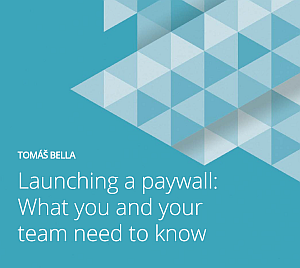 Guide #2 – Launching a paywall: What you and your team need to know, by Tomáš Bella. What subscription model is right for you? The aim of this guide is to help you avoid the largest traps that lie ahead as you seek to launch a subscription system, and to help you understand what needs to be done to build a successful project. About author: Tomáš Bella is co-founder and web director of an independent Slovak daily newspaper: Denník N (dennikn.sk), which also develops open-source software for publishers REMP (remp2020). Previously, he was Editor-in-Chief of the largest provider of Slovak web journalism, sme.sk, and co-founder and first director of Piano, now the world’s largest company offering publishers paywall software.